Discussion in 'SSD Discussion' started by Bruce Harrison, Mar 17, 2018. I have been reading your site for quite some time and thought that you might find this interesting. I asked Intel if you could use the 900P as a cache drive since it has the same technology as the 16/32 GB Optane drive and they said no. I tried it anyway and it actually works flawlessly. That's very good to know, thanks for sharing. That is actually very interesting but do you see a benefit from having that much of a larger cache compared to the now standard 64GB Optane? Also, could you comment on your system responsiveness with this setup? Is it the same as the Optane alone? 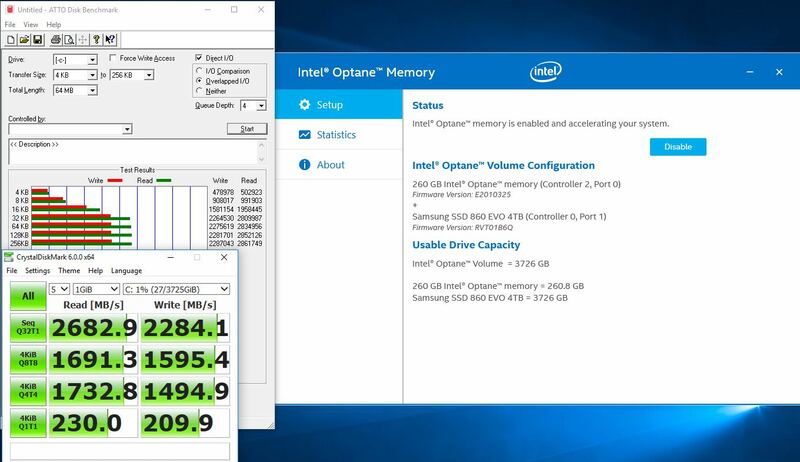 The smaller Optane drives do not have the insane 4KQ1T1 speeds like the 900P so they just can't compete. I have never built anything with a boot speed like that before. The overall speed is very close to using the 900P on its own. Benchmarks could see a small gap but when using it I could not "feel" it. Compared to the 4TB 860 EVO though the speed is very tangible, especially when booting, installing software and loading certain games.